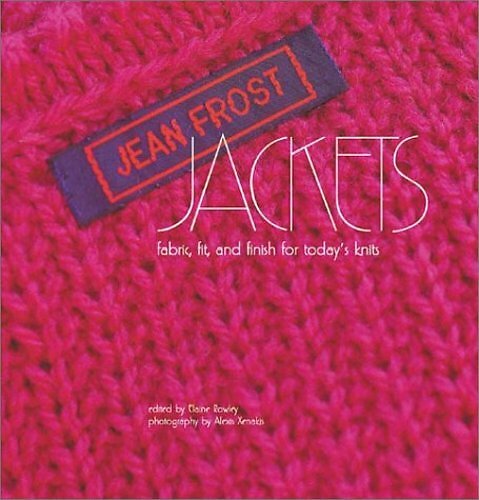 From ‘Jean Frost Jackets’: So many knitters are afraid to combine yarns of different kinds or weights. Here, I combine two very different yarns, linen and mohair, in a slip-stitch pattern to create an interesting fabric. This combination has become one of my favorites. 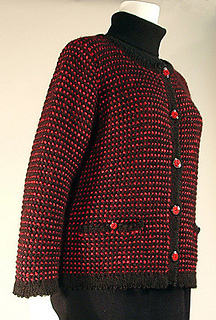 The style is Chanel with a stockinette border and pockets for interest. YARN REQUIREMENTS: Light-weight yarn, Main Color (MC) – 600 (700, 900) yds / 3 (3, 4) skeins and Contrasting Color (CC) - 200 (300, 400) yds / 2 (3, 4) skeins. SHOWN IN: Louet Euroflax Sportweight Linen, MC - #16 Navy and Louet Kid Mohair, CC - Red.